Steve Brown Apartments, a long-time partner of The Road Home, raised $5,000 and over 10,000 diapers to help families in our communities. Our business partnerships are critical in helping families in our community transition from homelessness to housing. There are many ways businesses can work with us. Steve Brown Apartments, a long-time partner of The Road Home, recently found some new, creative ways to make a difference. For their annual giving campaign, Steve Brown Apartments planned ten days of team-building activities to raise funds and collect items for The Road Home. Activities included a chili cook-off, partnership with Ian’s pizza to donate 25% of proceeds on one night and a community-wide diaper drop-off among other activities. 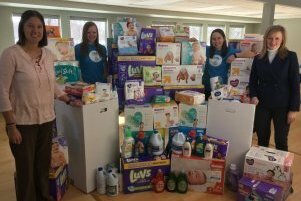 The result was $5,000 and over 10,000 diapers donated to help families transition to stable housing. Steve Brown Apartments’ efforts to end family homelessness stretch back many years. As a Second Chance Apartment Sponsor, they have helped families experiencing homelessness reach stability by paying their rent and providing mentors trained by The Road Home. They also have wish list drive bins at all of their locations for employees to donate needed items. Thank you to all of our business partners who make our work possible. And if you’ve got a new idea of how we can work together, we’d love to hear it!